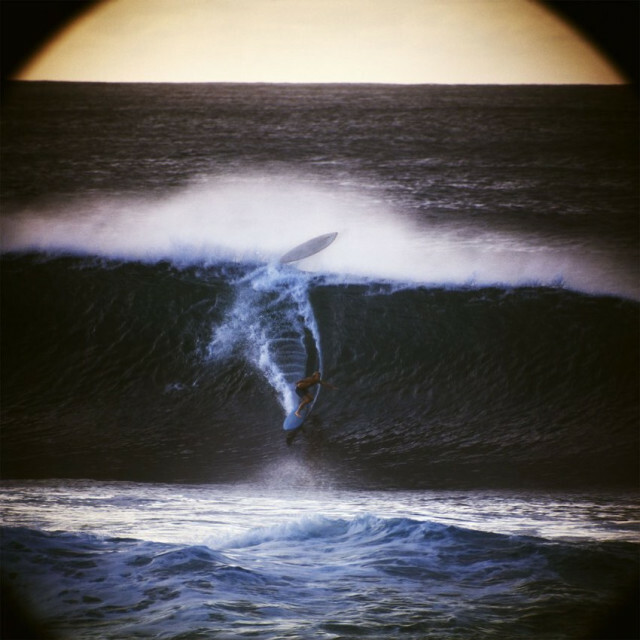 M+B and LACMA Muse present the first exhibition of large-scale, limited edition prints by legendary surf photographer LeRoy Grannis in Birth of a Culture: Surf Photography of the 1960s and 1970s from February 26 through April, 30, 2005. Featuring over thirty works focusing on what many consider to be the golden era of surfing--the Sixties and Seventies--Grannis' artistry captures the purity, soul and lifestyle of a seminal moment in American cultural history. Before there were short V-bottoms or the X Games, and long before autofocus cameras, motor drives or fast film, there was a man with an East German 35mm single lens reflex camera and a passion for surfing. And as in any good love story, he possessed the talent to combine the two as well. This man was LeRoy Grannis. Schooled by California's first surf photographer "Doc" Ball, Grannis would soon be hailed as one of the only photographers to capture the true essence of the surf culture that spread up and down the California coast--and the world--beginning in the 1960s. According to Brad Barrett, editor of Photo: Grannis, "Granny'" differentiated himself from the other surf photographers of his day by using a very slow, fine-grain, low contrast film that he pushed up to the speed the others used. This enabled Grannis "a texture about them that was somehow palpable, even in published form." This is not an exhibition of photography showcasing Kelly Slater surfing an 8-point right-hander, nor is it about hi-speed, hi-tech cameras. This is about the Sixties and Seventies. This is about the birth of a generation spurred on by the surf-film Gidget and the Beach Boys who created an entirely new youth subculture centered around the surfing lifestyle. Whether shooting surf-god (and surfing buddy) Greg Noll catching waves in Waimea Bay or a San Onofre parking lot filled with long boards, VW buses and surfer girls, Grannis' work nostalgically embraces both the lost elegance of the sport as well as the idealization of this uniquely California lifestyle. Grannis' poignant images record the decades' surfing spirit and evoke a sense of timeless grace that greatly contrasts to the modern-day "extreme sport" notion of surfing. A surfer himself, LeRoy Grannis was born in Hermosa Beach, California in 1917 and began shooting surf-culture images on 22 nd Street in Hermosa in 1960 as a hobby at the suggestion of a family doctor. His work immediately appeared in the important surf culture magazines of the time including Surfer, Reef and Surfing Illustrated . He quickly became one of the sport's most important documentarians, voted into the International Surfing Hall of Fame as the number one lensman in 1966, awarded SIMA's Lifetime Achievement Award in 2002 for his legendary surf photography and most recently, featured on the cover and within Taschen's Surfing: Vintage Surfing Graphics, and his stills were included in Stacy Peralta's documentary Riding Giants. The artist, now well into his 80s, continues working--and surfing--from his home near San Diego.